Thanks to the lovely weather, we got planting last weekend, and have set ourselves up for a rather tasty year with some favourite herbs. (That's hhhhh-erbs, just to be clear.) To be sure we remember who is who, and don't end up eating our flowers, I made each plant a little marker out of clay. 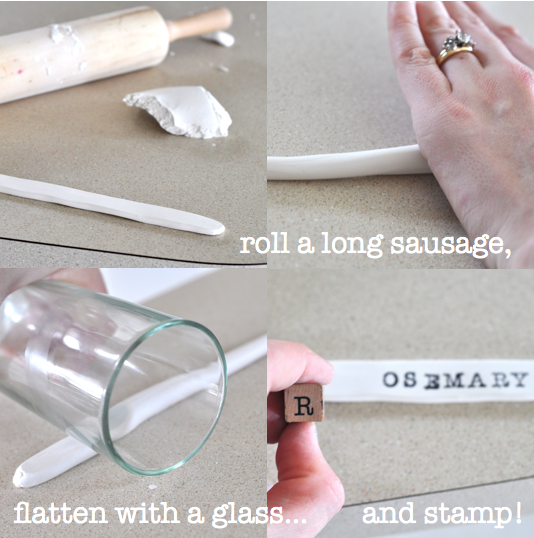 All you need is a packet of modeling clay (I used Sculptey), some alphabet stamps, and a needle and thread. 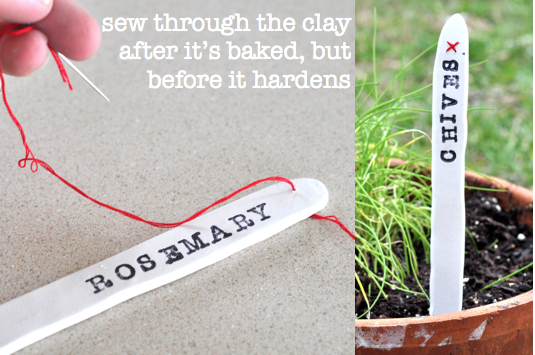 A 2oz packet of clay (which costs 30 - 50 cents) makes 4 garden markers. The trick to adding the cross-stitch is to sew through the clay just as soon as it's cool enough to handle (about two minutes after it came out of the oven). Be careful, it's rather hot at first! If you wait more than ten minutes, though, the clay might be too hard already. My advice -- bake them in batches of three or four, to allow yourself enough time to sew them all before they harden. I'd love to know what you've been planting this year, and am eager for any tips about what grows well in Texas! 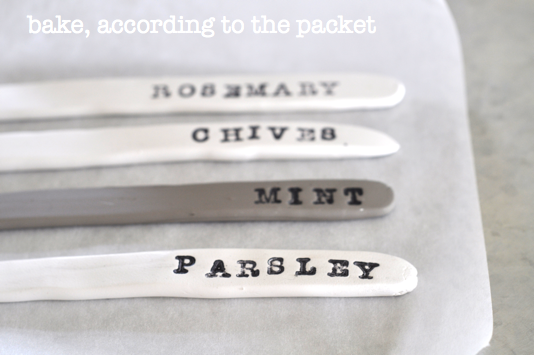 Hey Astrid this is a brilliant idea........I have been searching for a way to make plant markers. I have a pack of air dry clay stuff somewhere and I love the cross stitch too. I wonder if you could make the needle holes before you baked them?!! Fastidious answers in return of this matter with solid arguments and explaining all on the topic of that.